This image by the Event Horizon Telescope project shows the event horizon of the supermassive black hole at the heart of the M87 galaxy. 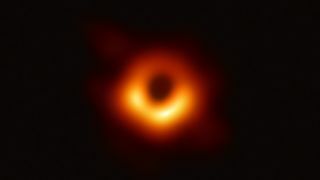 The first-ever images of a black hole, which the Event Horizon Telescope (EHT) project unveiled today (April 10), further bolster Einstein's century-old theory of general relativity, researchers said. "Today, general relativity has passed another crucial test, this one spanning from horizons to the stars," EHT team member Avery Broderick, of the University of Waterloo and the Perimeter Institute for Theoretical Physics in Canada, said during a news conference today at the National Press Club in Washington, D.C.
Related: What Exactly Is a Black Hole Event Horizon (and What Happens There)? General relativity describes gravity as a consequence of the warping of space-time. Massive objects create a sort of dent or well in the cosmic fabric, which passing bodies fall into because they're following curved contours (not as a result of some mysterious force at a distance, which had been the prevailing view before Einstein came along). General relativity makes specific predictions about how this warping works. For example, the theory posits that black holes exist, and that each of these gravitational monsters has an event horizon — a point of no return beyond which nothing, not even light, can escape. Further, the event horizon should be roughly circular and of a predictable size, which depends on the black hole's mass. And that's just what we see in the newly unveiled EHT images, which show the silhouette of the supermassive black hole at the heart of M87, a giant elliptical galaxy that lies 55 million light-years from Earth. "The shadow exists, is nearly circular and the inferred mass matches estimates due to the dynamics of stars 100,000 times farther away," Broderick said. That mass, by the way, is 6.5 billion times that of Earth's sun. That's huge even by supermassive-black-hole standards; for comparison, the behemoth at the heart of our Milky Way galaxy weighs in at a mere 4.3 million solar masses. As Broderick noted, this is not the first test that general relativity has passed; the theory has survived many challenges over the past 100 years. So, it's not exactly a surprise that Einstein was right about event horizons as well. But confirming that general relativity holds in a hitherto unstudied realm has great value, EHT team members said. EHT's work "has verified Einstein's theories of gravity in this most extreme laboratory," EHT director Sheperd Doeleman, of Harvard University and the Harvard-Smithsonian Center for Astrophysics, said during today's press conference.